*I received free product from Abbott foods in order to do this product review. All opinions and thoughts are honest and my own. Working busy holiday hours in retail, I was always sure to keep an assortment of snack and meal bars in my bottom desk drawer for those days I just didn't have time to break for lunch. They were great to keep in my purse, too for a quick breakfast on the bus on my way to work! So, I guess you can say that over the years I've eaten my fair share of nutrition bars. Some good, some bad. I was so excited when the nice people from Abbott sent me some of their ZonePerfect Greek Yogurt nutrition bars to review! Earlier this year, Abbott added 3 new flavors to their ZonePerfect brand of nutrition bars ~ Greek Yogurt Chocolate, Greek Yogurt Raspberry & Greek Yogurt Vanilla Berry. These Greek Yogurt coated bars are packed with 12 grams of protein and 3 grams of fiber! A perfect snack for those busy days when you just don't have the chance to take a break! Although I am no longer working those crazy holiday hours in retail, my life as a mom keeps me just as busy...especially now, with the holidays approaching. Earlier this week, Joe and I decided to get a jump on shopping for our Thanksgiving meal and hit a crowded new store that opened in our area. Lots of people wandering around the new store trying to get a feel for where everything is located really made our quick trip take longer than we anticipated. Plus, having Grace in tow always makes errands drag on longer than they should. Thankfully, I packed Grace's go-bag with a couple of the ZonePerfect Greek Yogurt Chocolate Nutrition bars! These were great! Not only were they a delicious treat! They also curbed our hunger and allowed us to finish our errands without spending a fortune on snacks not on our shopping list! Ever go food shopping hungry? Not a good idea! I'll be sure to always keep a few of these ZonePerfect bars in my bag at all times! And you should, too! 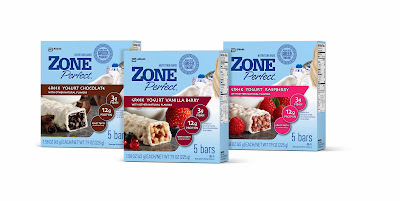 ZonePerfect Greek Yogurt Nutrition Bars are available in the nutrition aisle of many grocery stores, drug stores and other mass merchandise stores or can be purchased from their online store. You can also sign up to become a ZonePerfect VIP and receive exclusive news and special offers! Would you like to win your own stash of ZonePerfect Greek Yogurt Nutrition Bars to keep in your purse or go-bag to help keep you in your holiday shopping zone? Just enter using the entry form below! I like berries and all but I am a chocoholic! so Chocolate please! !